Click on the above image to download the sizing chart. Be sure to fill this out accuately- once you've sent us the specific sizes for your uniform, it's billed and made based on the information YOU give us. Please email us with any questions you have on sizing before you order. Contact G-Max TailoringPricing and Contact information. Pricing: E-Mail us for current pricing. 1. Contact us for product availability and total shipping cost before ordering. Be sure to be exact about what you want. Insignia? No Insignia? BEVO/Embroidered? Size? Custom details on a standard style feldbluse (eg pointed collars on an M36?) Please be sure to let us know before you order or ask for a quote. Don't just email us and ask us for 'What's the price for a feldbluse and hosen?' give us working details we can work off. If you want 'it', we can make 'it' to your specifications. 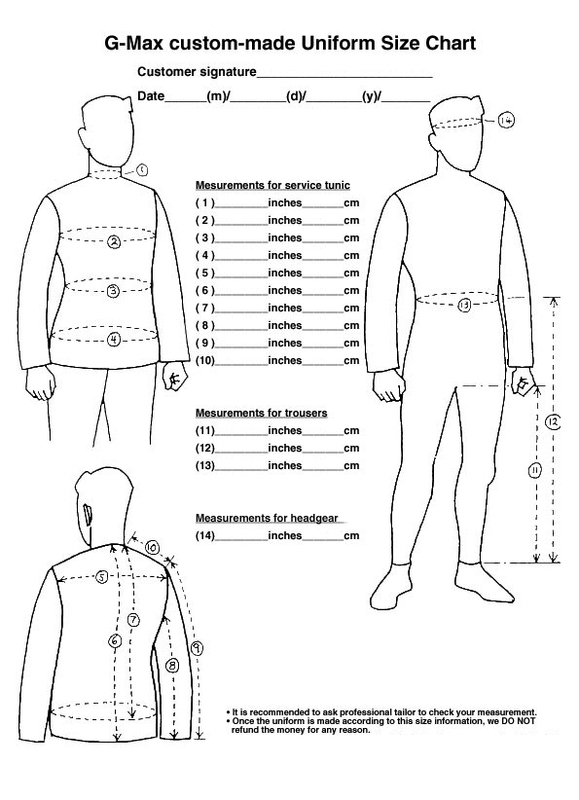 2: Download the clothing sizing chart here. Be sure to fill this out accurately. Once you've sent us the specific sizes for your item, it's billed and made based on the information YOU give us. 3: Or email us your sizing according the chart and send it to us with your payment. 3. To mail us the payment, please email us for our mailing address. 4. We process the order after payment is received. 5. Cheques must clear before your order is processed.